Curiosity got the better of me and I looked on line to see if I could find out more about these cool cups. After a few minutes of searching I found the cups on Etsy! (They are available here.) I knew there was a reason I couldn’t put them back on the shelf! They were just too “Etsy” to be left at the thrift store. The best part is that I saved $38! The set retails for $42 plus shipping. They’re really sturdy though and we all love them. 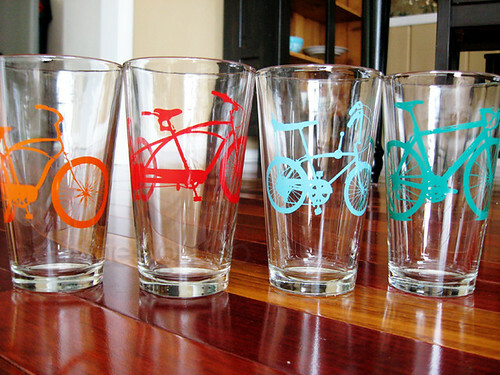 These would make a really cool gift for any avid biker. 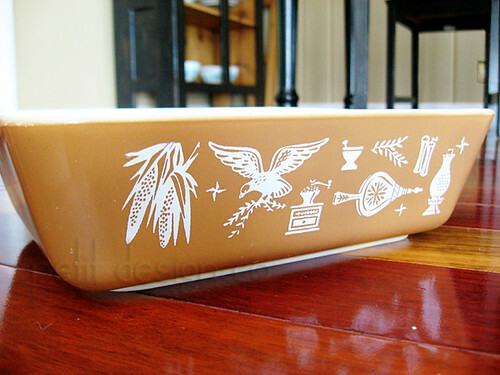 I also saved this cute Pyrex baker in the “Americana” print. Do you like thrifting? Have you had any awesome finds lately? What a great find!! I just love those cups-so cool. The tandem bike one is my favorite but all 4 are amazing. Wow what great finds! I've never seen vintage Pyrex but always look. I buy most of my own clothes secondhand. It saves a lot! Wow I love the glasses you scored! thanks for sharing a link where to find some more... I also love pyrex,, I am collecting to use and pass down to my 3 daughters.